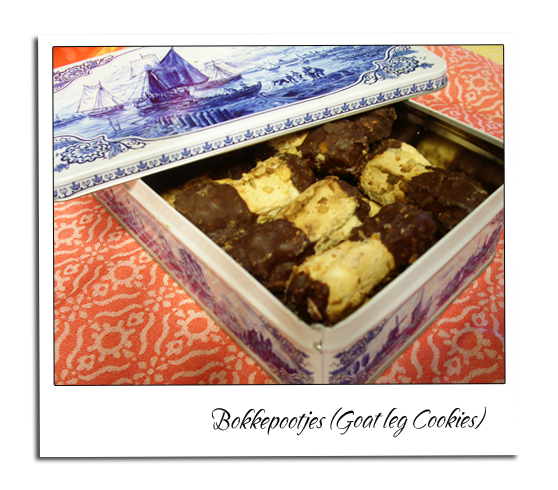 This is another cookie from The Netherlands, A great companion with a cup of coffee or tea. Bokkepootje translated means goat leg. If you look at the cookie it actually looks like one. Just use your imagination 🙂 They are crunchy on the outside and soft on the inside. 1. Add the almonds to the food processor and grind them up till fine powder, Whisk the egg whites with the half of the sugar. After you’ve gotten a little foam, add the other half of the sugar.Continue whisking. Add the flour to the fine powder almond. 2. Add the grind-ed almond mix to the whipped egg whites. Fill the pastry bag with this mixture and squirt on a greased baking sheet. Sprinkle with almonds if you like. Bake in an oven at 180 degrees for 10 minutes. Put the chocolate in a bowl microwave for a minute or so. Stir in between till all melted. Take two cooled of pieces of cookies and dip the ends in melted chocolate. 3. You can add marzipan in between the cookies but you can eat them without it to. To make the marzipan grind the almonds in a food processor for about two minutes. Keep it going till it’s fine powder, when it nearly forms clumps, that’s when you’ve got it right. Add the confectioners’ sugar and almond extract, then the corn syrup, processing until well-combined. 4. Turn the mixture out onto a work surface and knead until it makes a smooth dough. If the dough seems too sticky, knead in a little more confectioners’ sugar. If it seems too dry, add more corn syrup. At this point, the dough can be tightly wrapped in foil and refrigerated until needed. Add the almonds to the food processor and grind them up till fine powder, Whisk the egg whites with the half of the sugar. After you've gotten a little foam, add the other half of the sugar.Continue whisking. Add the flour to the fine powder almond. Add the grind-ed almond mix to the whipped egg whites. Fill the pastry bag with this mixture and squirt on a greased baking sheet. Sprinkle with almonds if you like. Bake in an oven at 180 degrees for 10 minutes. Put the chocolate in a bowl microwave for a minute or so. Stir in between till all melted. 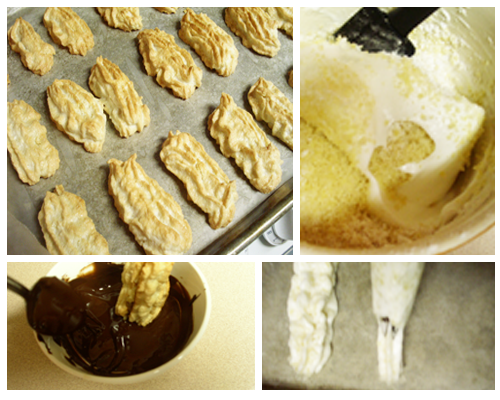 Take two cooled of pieces of cookies and dip the ends in melted chocolate. You can add marzipan in between the cookies but you can eat them without it to. 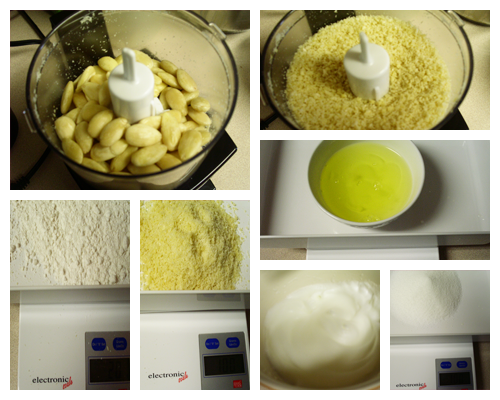 To make the marzipan grind the almonds in a food processor for about two minutes. Keep it going till it's fine powder, when it nearly forms clumps, that’s when you’ve got it right. Add the confectioners’ sugar and almond extract, then the corn syrup, processing until well-combined. 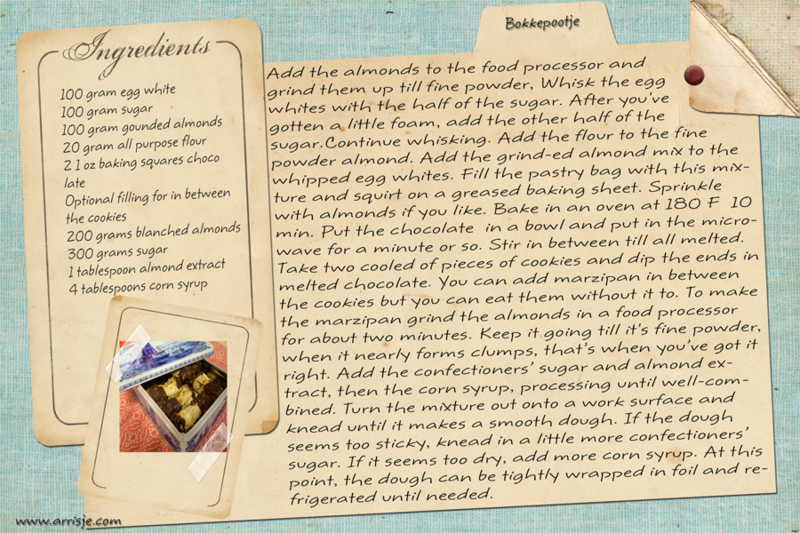 Turn the mixture out onto a work surface and knead until it makes a smooth dough. If the dough seems too sticky, knead in a little more confectioners’ sugar. If it seems too dry, add more corn syrup. At this point, the dough can be tightly wrapped in foil and refrigerated until needed. What kind of chocolate? Unsweetened?